G&P Trucking Co., Inc. partnered with Apprenticeship Carolina™ and Orangeburg-Calhoun Technical College to develop South Carolina’s first Logistics and Transportation Apprenticeship in 2010. Roger Griggs, director of recruiting for G&P Trucking, described the evolution of the company’s apprenticeship program. 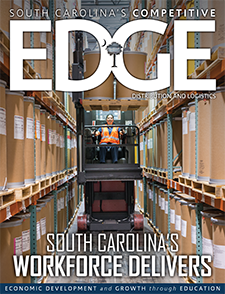 EDGE: What kind of training partnership do you have with your local South Carolina technical college? 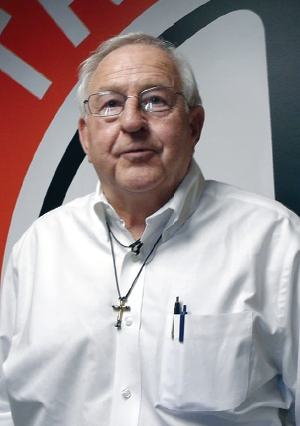 Roger Griggs: One of the things we find most attractive about the technical colleges over every other available truck driver training program is that the technical college programs are six to eight weeks as opposed to four weeks of training. This 180 hour-plus training has been a better fit for us, and it has enabled us to get a better-quality driver. EDGE: How did you decide to start an apprenticeship program? RG: We set up the training program originally with Orangeburg-Calhoun Technical College in Orangeburg, and they introduced us to the Apprenticeship Carolina program. When we first met with Apprenticeship Carolina, they actually came to our facility here and walked us through the program from beginning to end. They made it really easy to set up. EDGE: How does the technical college training help the new apprentices? RG: The apprenticeship program is a continuation of what the technical college provides. We only accept students in the apprenticeship program with 180 hours plus [of training]. The only place to find them is at the technical colleges. They put the platform in place, and then we springboard from that. After that, we put them with a mentor for a four-week period. They get one-on-one training in a truck, and then they receive continual training as they are assigned to a driver manager. Even though it’s a 12-month apprenticeship program, there’s about a four-year learning curve until a driver becomes 100 percent proficient. During that entire time, they are continually being trained. EDGE: Has the apprenticeship program helped with driver safety? RG: We have had just tremendous success with the students. I can tell you that [since] we’ve been in this program we have not had a major accident from any student that was their fault. EDGE: Has apprenticeship helped employee retention? RG: We have considerably better retention from new students coming into our program because of the hands-on training that the technical colleges provide – the 180 hours plus. I can’t overemphasize how important that training is because the students are so much more prepared. Being able to come into a structured training program at G&P Trucking has afforded them the opportunity to be more successful, more qualified and more satisfied as an employee with our company. EDGE: What are some other benefits of apprenticeship for your company? RG: Our company has enjoyed a tremendous advantage through apprenticeship. We are not only able to find the students we need, but we also enjoy the tax credits associated with apprenticeship each year. The system and the plan are working extremely well. The Apprenticeship Carolina program has also helped us to expand into a Veterans Affairs (VA) apprenticeship program. This program was made possible because the VA accepted the apprenticeship program developed through Apprenticeship Carolina in its entirety. That really made it so much easier for us to bring veterans onboard, and I believe we are currently the only trucking company in the state of South Carolina with both programs. EDGE: How do you see apprenticeship helping your company grow? RG: In today’s marketplace, there is such a substantial shortage for truck drivers, and the only way that a trucking company our size can continue to fill trucks is by bringing new people into the industry. The SC Technical College System and Apprenticeship Carolina have given new life to us. They are a proven source for bringing in drivers needed to fill our trucks. 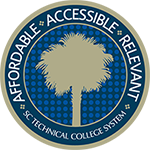 This has enabled us to go ahead with plans for growth at our company, and we will be relying heavily on resources from the SC Technical College System in the future as we move forward with our growth plans over the upcoming years. Apprenticeship Carolina is and has been a big part of our past, present, and our future plans here at G&P Trucking. We are just tickled with the program, and we plan to expand on it. I would encourage any company, whether trucking or not, to take advantage of the resources available right here at our technical college system.